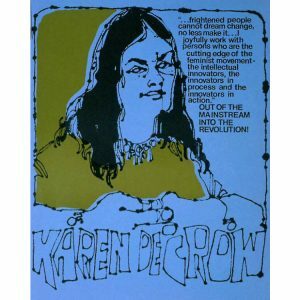 Some of you knew of Karen DeCrow, lawyer, a 1970s national president of the National Organization for Women (NOW), debater of Phyllis Schlafly, widely known feminist and 2009 Women’s Hall of Fame inductee. Karen DeCrow (née Lipschultz), was born on December 18, 1937 and died on June 6, 2014. A Chicago born and raised attorney, she was also an author, activist and feminist. When we were both four years old, Karen and I became friends. We grew up a few apartment buildings apart on Pratt Blvd, east of Sheridan Road, in Chicago’s Rogers Park. As we spent our childhood and adolescence together, we became best friends. Attending grammar school (Kilmer) and high school (Sullivan), daily, Karen and I walked – with my sister Lois – to school, back home for lunch, back to school, and back home again. Karen and I were inseparable – people often found it impossible to distinguish our voices. Together, we read books, ate candy, and were occasionally naughty. In third grade, disguising our voices, we phoned one of our grammar school teachers, who replied: Kilmer, 1, 2, 3, 4. In 4th grade, I pulled Karen’s braids as I stood behind her in line, startling the teacher who thought we were friends. Karen, Lois and I called ourselves “The Three Blood Drops” and naughtily inserted flame-singed paper messages featuring images of red blood drops into empty milk bottles awaiting pickup on neighbors’ back porches. A more productive enterprise was the nursery school we three created, though it was attended by only one little girl. As we grew up, often with a new friend, Nancy Pottishman (Weiss), we sunned ourselves at Farwell Beach, gazing longingly at the life guards. 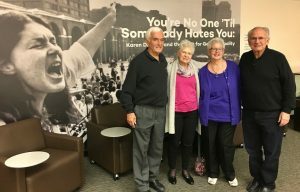 Throughout the years, our lives remained intertwined After visiting China, at a time when tourists were rare, Karen accepted a WBAI invitation to share her vivid impressions. After breaking up with her husband Roger DeCrow, Karen called me, and I took a train to Syracuse, New York to comfort her. For the 90th birthday of Juliette Lipschultz, Karen’s mother, my husband and I flew to Miami Beach, Florida to celebrate with Juliette, and her daughters, Karen and Claudia. In recognition of the death of Rose Matelson Adelman, a lawyer and WBAI member, and my mother, who was also Karen’s good friend, Karen made a special donation to WBAI. Recalling the bad old days when girls were taught to deny both their brains and their sexuality, DeCrow was tangibly impatient with the idea that “being whistled at, or even slurped at” amounted to “oppression,” reported journalist Kathy Young. She was also a strong supporter equal rights for men in custody decisions and the choice of whether or not to become a parent. “But DeCrow was the last NOW president to hold such views, sensible as they are,” reported journalist, Robert Franklin, Esq. “Since then, no feminist organization anywhere has ever supported an equal parenting bill, and many have outright opposed them. So DeCrow’s passing marks the end of an era – the last generation of feminists to understand the value of shared parenting to women,” he wrote. I believe, had Karen lived longer, her probing, intelligent and independent mind would have produced additional insightful views. Charlotte Adelman is the WBAI Historian, author of WBAI 75, and served as the organization’s President from 1984-5. She also helped establish the Wilmette Park District’s Centennial prairie garden and coauthored, among others, The Midwestern Native Garden: Native Alternatives to Nonnative Flowers and Plants and Midwestern Native Shrubs and Trees: Gardening Alternatives to Nonnative Species: An Illustrated Guide. If you missed Charlotte’s previous appearance on my blog, here is a link: But I Am The Graduate, Not My Husband! Charlotte grew up in East Rogers Park near where my family settled after immigrating to the United States. I am proud to say that Charlotte is my friend.